The opinions expressed in this column are solely those of the author and do not necessarily reflect those of Microsoft. All prices were confirmed at the time of writing and are subject to change. Keeping tabs on your company’s assets is essential to efficient systems management. Similarly, being able to track your help desk cases keeps you from getting buried and wasting precious time. If you are looking for an easy-to-use, lower-cost, help desk and asset management tool, you’ll want to evaluate Alloy Navigator Express from Alloy Software. Alloy Navigator Express gives you a centralized repository (a SQL Server Express back-end by default) in which you can store information and report on your company’s machines, peripherals, networks, IP addresses, vendors and software licenses. In addition, you get a help desk issue-tracking tool and a simple knowledge base for recording solutions to end-user issues. The help desk component includes a self-service portal that allows your users to access the knowledge base and ticketing system directly, saving you from at least some of the help desk-related phone calls and e-mails, not to mention allowing users in different time zones to get tickets issued outside of your office hours. The product also has a simple contract and purchase order component to keep your hardware, software and consultancy orders in organized. Numerous predefined reports are included with the product, but you can also use the report designer to tweak and tailor those reports to your needs. Data entry with the product is straightforward and form-based, and you can create templates for different machines and components so you don’t have to type in repeated information over and over. You can download Alloy Navigator Express for a free 30-day trial, and if you need more time before you make the purchase, you can request an extension via the sales group. Alloy Navigator Express is priced per user and starts at $250 for a single “technician” license, with discounts as you increase user volume. You’ll also need a node license per machine, which starts at $3 for one to 200 machines, again with volume discounts. Larger organizations or those looking for a more robust feature set may also want to take a look at Alloy’s enterprise service management product, Alloy Navigator. Whether you’re setting up a new machine for a client or creating a system image, it’s best to ensure the system is as clean as possible before you hand it over or capture the system image. That means removing all traces of your testing, history and configuration information from the system. The simple and portable utility CleanAfterMe from NirSoft.net is a free tool that can help you clean up your trail. 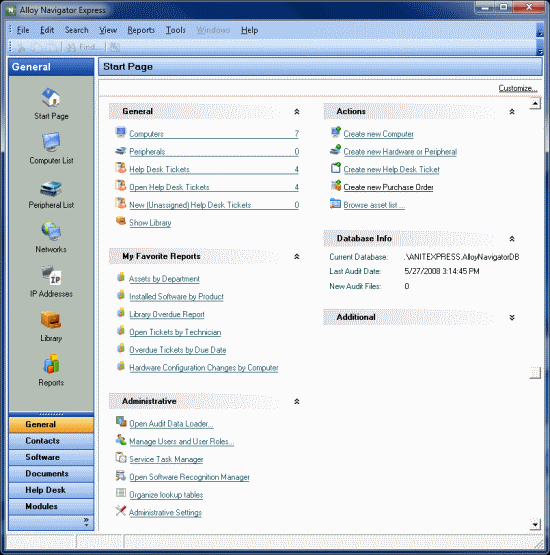 As with the other free, useful tools on the site, CleanAfterMe was written by Nir Sofer. CleanAfterMe is a single 38K executable that you can easily carry on your management tools CD or USB key as it requires no additional files or registry entries to function. When you launch the utility, you are presented with a categorized list of the different paths the tools can clean up. The Windows Explorer category cleans registry entries for the Explorer Start | Run history, Recent Documents list, UserAssist list, Save/Open and Last Visited dialogue boxes, as well as My Network Places and the Recent folder. 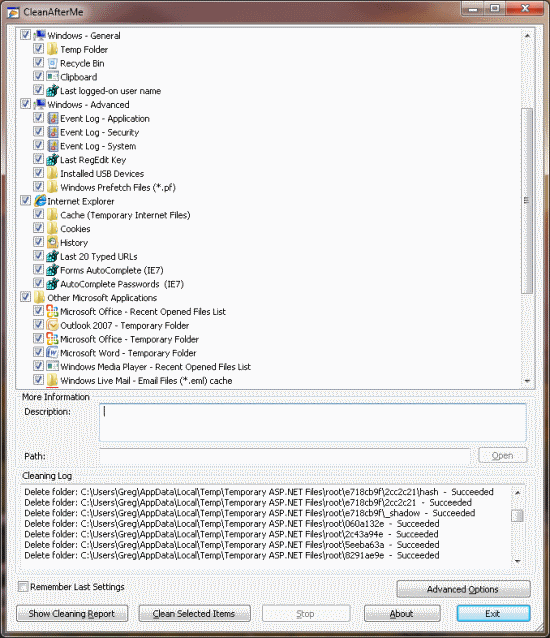 The Windows – General category deletes everything in your Temp folder, the Recycle Bin, the Clipboard and the “last logged-on” username, while the Windows – Advanced category cleans out Event Logs, RegEdt32 key history, installed USB devices and Windows Prefetch files. The Internet Explorer category wipes the cache, cookies, history, last-typed URLs, as well as the forms and passwords AutoComplete history. And the catch-all Other Microsoft Applications category lets you clean up after Microsoft Office, Visual Studio, Windows Live Mail, and Windows Media Player among others, deleting histories and temporary files. Two other browser categories appear if they’re detected when the utility loads: FireFox and Opera. Much as with Internet Explorer, you can also choose to wipe the cache, history, form history and cookies. Once you’ve selected the history to erase, you click Clean Selected Items and off it goes. You can get a report both before and after execution, so you can see exactly what actions will or did take place during the cleaning operation. Clicking on an individual cleaning item in the tree-view shows you a simple description of the action that will be taken, as well as the path to the registry key or folder that will be cleaned. You can check the Remember Last Settings box to help speed the process on the next go. By default, CleanAfterMe does a simple delete of the selected options, but you can also choose to have the application fill files with zero bytes before deleting for extra protection. And, if you want to integrate the tool into your imaging scripts directly, it supports basic command-line options (/clean /report) as well. Cleaning up after yourself is always a good idea, and when it comes to cleaning up your systems before delivery or imaging, a tool like CleanAfterMe can make the job much easier. Staying on top of the latest security bulletins and application hot fixes is key to successful Windows infrastructure management. Microsoft Update goes a long way in automating the download and installation of essential patches, but using that tool is not always an option for production machines. To help you keep up with all the latest releases, the Web site KBAlertz.com has a simple, free service to alert you via e-mail when a new fix, patch or statement has been released for your Windows-based machines. The service works by scanning the Microsoft Knowledge Base in its entirety each night, incorporating any new additions into its own “meta”-base. When you sign up for an account on the site, you can choose which applications you’d like to be notified about, so you won’t be inundated with non-essential alerts. There are also RSS feeds by product if you’d rather receive your updates that way instead of via e-mail. The site lets you choose from quite a number of Microsoft products, from SQL Server 2008 to Office for the Mac, so you should be able to tailor it to the ones you use in your environment—though some products are covered better than others for sure. Besides the e-mail alerts, you can also search for KB articles by number or title on the site. The KB detail page gives you all the details you find on the Microsoft site, as well as quick download links and links to hotfix request pages for those that require it. In addition to “latest first” listings, you’ll also find a “what’s hot” view, for both the entire set of Microsoft KB articles and for individual products, so you can see what other KBAlertz.com users are checking out (which can be quite useful for indications as to what your fellow IT Pros are running into with their environments). A comment section at the end of each KB reproduction makes it easy for you to help those fellow professionals out if there was a “sneaky” element to your solution related to the KB article as well. 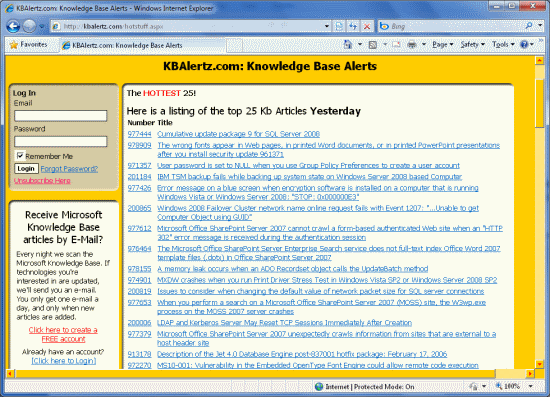 If you’re looking for a free alternative notification system for Microsoft KB articles, check out KBAlertz.com. Greg Steen* i*s a technology professional, entrepreneur and enthusiast. He is always on the hunt for new tools to help make operations, QA and development easier for the IT professional.